This will prove to be a highly relaxing full day trip to the beautiful city of Jabalpur with a guarantee for enjoyment, convenience, and safety. The service has been designed to suit a number of local tour purposes including sightseeing, attending meetings, shopping, seminars, visiting hospitals, and a lot more. If you have limited time for Jabalpur trip, allow us to take care of things. We will take care of all of your half day trip requirements. 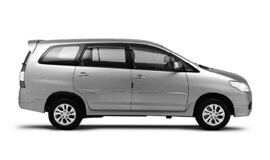 Some of the most popular services under this category include Airport Transfer in Jabalpur, Car rental service for Marriage, party and event, Corporate Cab Rental in Jabalpur, Railway Transfer, visiting hospitals and a lot more. We have exclusively designed packages for outstation travel. The service is devised by our dedicated team of experienced professionals and guarantees exceptionally enjoyable trip experience with friends. You can also expect best of excursions, enjoyable weekend getaways, and family leisure trip outside the city limits with our car rental outstation travel services. We provide our customers with exceptional quality to and fro taxi facility for your Jabalpur visit needs. It is available for various destinations from Jabalpur. Our one way drop hire service will help you enjoy premium quality taxi service to your desired destinations starting from Jabalpur. For multiple city visits in a given period of time, simply rely on our exclusively devised multi city travel hire services. With us, you can rest assured about having a unique travel experience throughout. Looking for a travel and car hire plan specially designed for you in Jabalpur? We at My Taxi India hold expertise in customizing packages as per your specific car rental and tour needs and budget. We guarantee the best car rental services in Jabalpur at highly affordable prices. Jabalpur has a humid subtropical climate. The summers in Jabalpur are hot and dry wherein the maximum temperature rises to around forty degrees. March, April and May, June are summer months in Jabalpur. July, August and September are typically Monsoon months in the region. Jabalpur experiences South West monsoon. Maximum temperature during winter is around 34°C. As per official census report for the year 2011, Jabalpur district has a population of 1,267,564 residents. The Narmada River has contributed to an agrarian economy in Jabalpur. The land of the Narmada basin along with its fertile alluvial soil ensures brilliant yields of sorghum, wheat, rice and millet. Jabalpur is home to Grey Iron Foundry, Vehicle Factory, Gun Carriage Factory Jabalpur and the Ordnance Factory. The Ordnance factory manufactures a huge of products such as mortars, bullets, howitzers, rockets, grenades, bombs, shells, trucks, mine protected vehicles, bullet proof vehicles, and a lot more. Some of the other significant industries in Jabalpur include IT industry, Garments, Education and Consultancy, Building materials, Electrical goods, Glassware, Limestone products, Telephone parts, Foodstuffs, Furniture, Cement Industries, Industrial Safety Goods, Mechanical Engineering Steel Structures, and Tobacco products. The city of Jabalpur is widely favoured for tourism value in Madhya Pradesh. It is blessed with natural scenic beauty of hills, river, ponds, water-fall, historical monuments, and many other elements enough for drawing tourists to the state. Bhedaghat is popular for boating site of Jabalpur city. Other important sites of tourism value include the Dhuaandhaar Waterfall, Madan Mahal Fort & Balance Rocks, Chousat Yogini Temple, Bargi Dam & Narmada Valley, Dumna Nature Researve, Tripur Sundari Temple, Bedaghat, Bargi Dam, Rani Durgavati Museum, Pisanhari Ki Madhiya, Tripur Sundari Temple, and Dumna Nature Park.